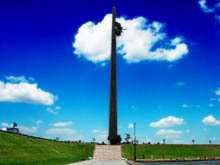 The tomb of great Genghis Khan, which has provoked many search expeditions over many centuries, is to be found in Tuva. This sensational hypothesis was offered at the Round Table meetings with participants of the First international tourism exhibition by the head of Tuva, Sholban Kara-ool. The Premier supposed that the place of burial could be at Chagytai lake. 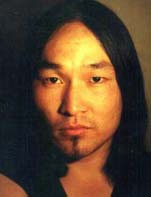 “That is not a Tuvan name, and we know that one of Genghis Khan’s sons was named Chagytai.”. The head of the republic also noted that according to one of well known legendary sources, the protection of the place of the Khan’s burial was assigned to one thousand soldier-guards of the Uriankhit tribe, who, for that reason, were excused from regular military service. During the past month, wolf hunts killed 56 of the grey predators in Tuva. 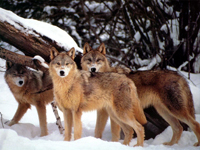 Total number of wolves killed this year is 91. During the entire last year, 193 of the grey predators’ pelts were handed in. 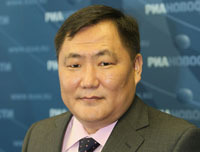 The head of the hunting and fishing commission, Alexander Novikov reported these facts to Premier of Tuva, Sholban Kara-ool, at an administrative meeting involving the representatives of the districts. In Tuva, as part of the project “Moya Pobeda” (My victory) all the monuments to the soldiers of the 1941-1945 war will be renovated and restored. Together with the local administrations, the community will participate: associations of enthusiasts, school regional knowledge clubs, and other community organizations. 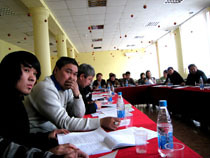 In the year of Tourism, Tourism Association was founded in Tuva. Today, its constitution was voted on by all the members of the constituent assembly – representatives of tourist firms, restaurant and hotel business, and cultural institutions. The Board of the Association was voted into office, consisting of 9 people and the President. 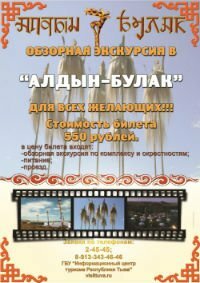 The head of the firm “Alash-Tavel”, Orlan Kirov, the “corypheus of Tuva tourism” as his colleagues call him, was selected as the head of the Association. 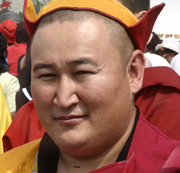 The leaders of Moscow assigned land for building a Buddhist temple in Victory Park on Poklonnaya Mountain. This was announced by RIA Novosti, referring to the mayor’s second-in-command in matters of sport, tourism and interregional co-operation, Sergei Bailakov. The decision about building the temple was made several years ago, but difficulties arose with assigning the actual plot of land. Monday was the first day after an almost two month period of -40 grade freeze, that the temperature rose to -25 degrees. The elders say: “It is always like this after Shagaa.” In Lunar calendar, Shagaa is the start of the spring-summer season. Interestingly, this Lunar New Year fell on the same date with Maslenica, which is also a symbol of parting with winter. 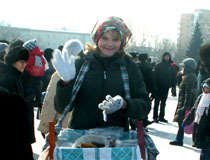 Regardless of the -40 degree freeze, the holiday activities yesterday on Museum Square of Kyzyl attracted great crowds. “Greetings with the New Year of the Tiger! Chaa chyl keldi! The human genius collected an anthology of horoscopes under the general title “Zvezdy i sudby” ( “Stars and Fate”). Every nation has its own variant – its own horoscope. Tsagaan-sar, the holiday of White Moon (Shagaa in Tuvan) is one of the most beloved holidays in Mongolia. Besides the traditional athletic contests and holiday prayer services, a great concert, dedicated to the Lunar New Year, took place in Ulan-Bator. This is the first time that this concert had international participation, including artists from Inner Mongolia (China), and the Buddhist republics of Russia. “Respected co-citizens! My dear compatriots! Please accept my most sincere greetings with the bright holiday Shagaa – the Eastern Lunar New Year! This holiday carries within itself customs and traditions of our ancestors, which are centuries old; it is a symbol of the unity and harmony of mankind with nature, which eternally renews itself, and of the triumph and victory of bright beginnings. “Dear compatriots, people of our multiethnic republic! In the name of all the lamas and followers of the Buddha’s holy Teachings of Tuva, as well as from me personally, I greet you with the bright holiday of Shagaa – with the beginning of the Eastern Lunar New Year of the Iron Tiger!